SYNOPSIS: According to her guidance counselor, fifteen-year-old Payton Gritas needs a focus object-an item to concentrate her emotions on. It's supposed to be something inanimate, but Payton decides to use the thing she stares at during class: Sean Griswold's head. They've been linked since third grade (Griswold-Gritas-it's an alphabetical order thing), but she's never really known him. The focus object is intended to help Payton deal with her father's newly diagnosed multiple sclerosis. And it's working. With the help of her boy-crazy best friend Jac, Payton starts stalking-er, focusing on-Sean Griswold... all of him! He's cute, he shares her Seinfeld obsession (nobody else gets it!) and he may have a secret or two of his own. REVIEW: Before the actual review, can I just I absolutely love the quirky title? And I also love the cover, it's just so simple and fun. 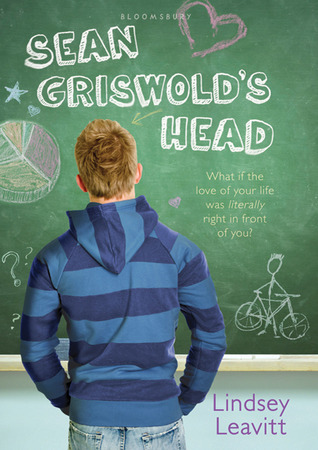 Sean Griswold's Head is a relatively quick read but it's quite enjoyable. For one, I liked how real the characters were. The protagonist, 15-year old Payton, is easily relateable. At first I thought she was being highly unreasonable when she felt so angry at her family (especially her dad) for choosing to keep news of her dad's illness from her for months. I mean come on the man has MS, do you really want to spend all the good days he has left ignoring him? But then I realized how much damage teen angst can cause. I'm only 20 years old so I pretty much remember how it was being 15. I understood that somehow Payton was diverting herself from the real issue: her dad was sick. The real diversion though is Sean; more importantly his head. It was so fun reading parts of Payton's Focus Journal because of her sense of humor and wit. Who knew you could write so much about a HEAD. When Payton got to know more of Sean and not his head, it added to my enjoyment. I loved Sean right away. I've been reading contemporary YA novels consecutively, maybe I've gotten used to reading about god-like boys falling in like/love with the seemingly ordinary female lead. So reading a book with a character like Sean Griswold is refreshing. He's cool but he's not the popular kid. He's an athlete but he's not the school jock. He's cute but girls don't swoon over him. He has all the nice qualities I look for in characters (or real life boys) but he's a little different from usual. Lindsey Leavitt is a good writer. I enjoyed reading how easy their friendship became, and how natural it was when they got together. At the same time, I also liked how the author was able to balance the story between Payton's love life and her journey to coping with the reality of her dad's MS. Lindsey Leavitt definitely kept me interested in knowing how both aspects of Payton's life will turn out. Lindsey Leavitt is a former elementary school teacher and present day writer/mom to three (mostly) adorable little girls. She is married to her high school lab partner and lives in Las Vegas. She is the author of the PRINCESS FOR HIRE series (www.princessforhire.com) and SEAN GRISWOLD'S HEAD.